If you are looking for that very special elusive gift, what could be better than giving something that will be seen and bring a smile to the face everyday, a pet portrait. A portrait of a beloved pet not only honours a friend past or present, it is a wonderful reminder of a soul who has given so much without question, always happy to see you, never holding a grudge and just full of love for you, coming back for more of you day by day. How amazingly wonderful! 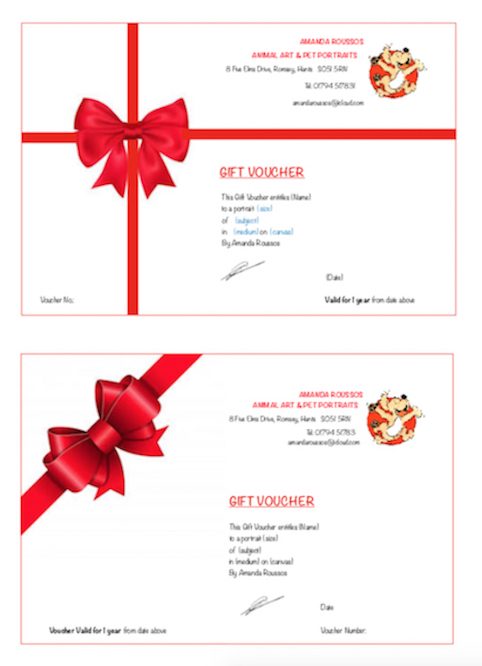 Below are the 2 Gift Voucher options you may choose from. For I dentification purposes you can call them "Parcel Bow Voucher" and "Diagonal Bow Voucher". If you are thinking about giving a Gift Voucher as a present, or would like to order one, please do contact me. It is not always possible to get hold of the best photos of the subject without spoiling the surprise, or perhaps you have left it a little late to ensure the completion of the commission and delivery by the date of the Birthday / Anniversary etc. However, by giving a Gift Voucher, not only can the receiver choose the photo they like the best, but they can also become involved in the excitement of ordering and waiting for the finished product. They also have the ability to "upgrade" the end product if they would like to; either a different size, or medium, maybe something specific and personal to the relationship etc. More importantly they get to agree final OK that the pet portrait / painting passes muster, and who more qualified to do that?